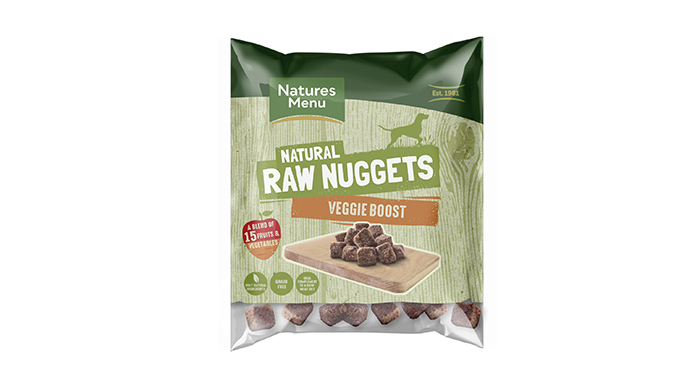 Natures Menu has refreshed its existing Fruit and Vegetable Raw Nuggets line with the addition of Natural Raw Nuggets Veggie Boost, as well as new look packaging. Part of the Natures Menu Home Prepare range, the Veggie Boost Nuggets are made from a blend of 15 fruits and vegetables including butternut squash, red cabbage, apples and pears. Sitting alongside the existing Fruit and Vegetable line, the latest variant of nuggets forms part of a wide-ranging menu of raw ingredients for those looking to feed a mixed raw diet at home and aims to offer an alternative to owners looking to add a little variety to their dog’s meals. Available in 1kg packs, Natures Menu said the nuggets are a perfect accompaniment to the rest of the Natures Menu Home Prepare Range, which includes raw chunks, treats and free flow minces, all providing a convenient way to make a raw meal. As well as a new variant offering, Natures Menu has also created new-look packaging for the range to help attract customers and boost sales for stockists. The refreshed packaging now comes with updated feeding advice and storage instructions as well as a window to enable customers to see the product.